A chipped or broken tooth can be more than just a cosmetic problem; it can really hurt! 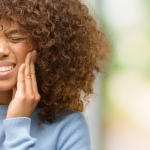 The impact it takes to chip a tooth can do some serious damage to the nerves and tissue surrounding the tooth, and the tooth itself can also really smart after the impact. 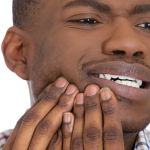 Of course, not every chipped tooth is painful; if you’re lucky, it’s just a cosmetic problem. But no matter what, we can all agree on one thing. You’ll want to get that chipped tooth fixed right away. But how do dentists fix a chipped tooth? Does it hurt? Do they have to replace the whole thing? Is it expensive? All of these are questions for a prosthodontist. A prosthodontist is a dentist who is an expert in replacing and repairing teeth using prostheses. A prosthodontist can fix a broken tooth, a chipped tooth, and even a missing tooth, all with cutting-edge dental techniques that look and feel real. Here’s how they do it. Here are a few common questions that prosthodontists get about procedures, and a few ways that the expert prosthodontics team at Penn Dental Medicine handles these cases. How Do Dentists Fix a Chipped Tooth? A chipped tooth can mean a small corner broken off or a large chip taken out of a tooth. However, with a chipped tooth, the break is clean and there is no further crack in the tooth. Prosthodontists can fix this problem with composite bonding, which is a tooth-like putty that is attached to the tooth and then dried to mimic a natural tooth, restoring its shape and function. Some dentists may also choose to repair the chipped tooth with a dental crown, a cap which fits over the chipped tooth and restores its natural shape. While this procedure takes longer, it also lasts much longer, and may be a more permanent solution, while composite bonding may only be temporary in some cases. How Do Dentists Fix a Broken Tooth? A broken tooth is like a chipped tooth, but more severe. Perhaps a large chunk of the tooth has been broken off, or maybe there is some root damage or a crack. In more extreme cases, the dentist may have to remove the tooth to prevent further damage and remove the risk of infection. If the tooth is extracted due to a severe break, the tooth would typically be replaced with a crown and bridge or implant to restore the smile. However, in less extreme cases, a dentist may simply file off the ragged edges of the tooth and install a dental crown over the damaged tooth. This is a much shorter procedure that will be easier on your mouth and still last a long time. How Do Dentists Fix a Missing Tooth? Dentists have several options available to them when they treat a missing tooth. 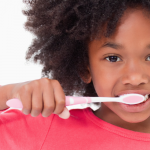 Depending on whether the tooth was lost to decay or trauma, a dentist may proceed differently. Generally, dentists will use one of two methods to replace that tooth as soon as possible. A dentist may use a crown or a crown and bridge to replace the missing tooth with a porcelain replica that is attached to your other teeth. This method replaces the tooth itself, restoring full functionality, but does not replace the root of the tooth. In many cases, this is actually fine, and you will be able to use your teeth as normal. However, in some cases, especially in trauma cases, replacing a root may be necessary. In these situations, the dentist will typically opt for a dental implant. 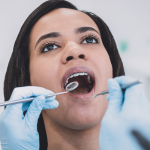 This procedure replaces both the root and the crown in a way that closely mimics the natural construction of the teeth, reinforcing the jaw and keeping the mouth healthy. A prosthodontist will be able to tell you which procedure is right for you if you have a missing tooth. These are a few of the ways that dentists fix chipped teeth, broken teeth, and missing teeth, but your dentist will know best. If you have a chipped or damaged tooth, don’t hesitate to call Penn Dental Medicine for excellent care at an affordable cost.